Wherever possible, a decision about taking part, or not taking part, in research should be a shared decision between a child or young person and their parents. What about children and young people who CAN make their own decision? Children and young people who have the ability to understand information about the research and make a choice for themselves should be asked for their consent, not their assent. Parents should usually be asked for their consent too, so that the decision is made together, as a family. 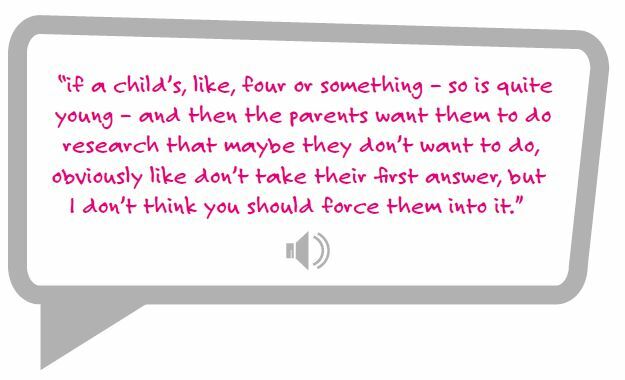 One way of recording this shared decision could be for children and parents to sign a consent form together. If the law says that a young person has the right to consent to research (16 in the UK) then, legally, only the young person’s consent is needed. However, many young people still prefer to involve their parents, or another trusted person, when they make their decision. Researchers should encourage this. What about children and young people who CAN’T make their own decision? As soon as children are able to express views or wishes about taking part in research (which may be as young as three), they should be involved in the decision. Some research guidelines say that children should be asked for their assent but there is little agreement on what this means in practice. We believe that assent should mean real involvement in the decision. Being involved in an important decision is not the same as making the final decision. Some decisions need particular knowledge or experience. It is a parent’s job to make the final decision if their child is not yet able to make their own decision without help. The fact that children and young people have been involved should be recorded in some way but it isn’t important how. For example, it could be in writing or drawing, in a voice or video recording, or using an app. 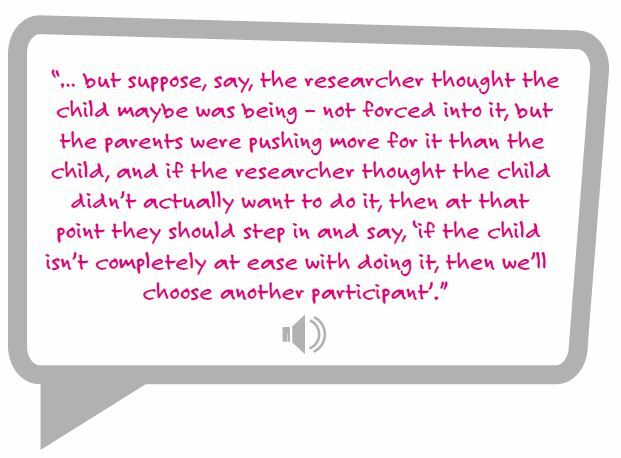 What if parents and children disagree about taking part in research? Researchers should always try to help families come to a shared decision. However, this isn’t always possible. In most cases, if not everyone in the family agrees, then it’s best if children or young people don’t take part in the study. The law allows research to go ahead with just a parent’s consent, even if their child disagrees. However, researchers may decide not to include children in a research study if they don’t feel it’s right – for example, if a child really doesn’t want to take part, and the researcher believes that it would cause more harm than good to continue. However, if the research is about the best way to give the treatment that a child is having, then researchers will be more likely to accept the parents’ consent. For example, parents might decide that it is right for their young child to take part in research as part of their treatment for cancer, even if their child doesn’t really want to. What if young people don’t want to involve their parents? Sometimes it may be necessary to carry out research with young people without their parents being involved. For research like this, researchers should ask the research ethics committee to agree that parents don’t need to be involved. The committee might ask the researchers to discuss their idea first with people in the local area to explain why they believe the research is important. This may help parents to feel things aren’t being done behind their backs, even if they don’t know whether or not their own child is involved.